"The painters were very pleasant & they not only did an excellent job of painting & wallpapering, but they cleaned everything up afterwards. We'll definitely use you again "
Schedule your "Painter For A Day"
preparation of areas to be painted.  Excludes all finish coat paint products. 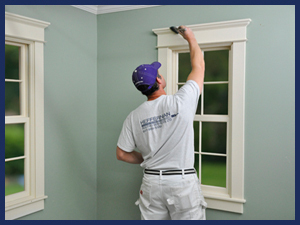 Paint is to be supplied by the customer or may be provided at an additional charge.  All work performed at customer's direction. *Work over 7½ hours to be billed at $65.00/hour + materials.